For centuries, acupuncture has been a fundamental component of Chinese medicine. This ancient therapy largely involves the insertion of fine needles into the body at specific points shown to be effective in the treatment of health problems. These points have been mapped by the Chinese over a period of two-thousand years, and there are more than a thousand known acupoints. Through the insertion of needles in these acupoints, Dr. Bret Mosher can stimulate and regulate the flow of energy through the body and treat a variety of health conditions. 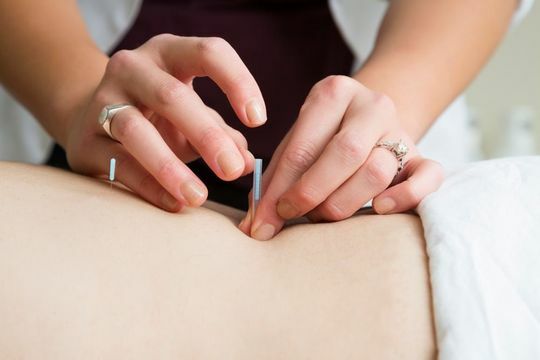 Although many people in the western world immediately associate acupuncture with needles, several adjunct therapies also fall under the umbrella of acupuncture. At our Poway practice, serving communities throughout the North County and the rest of San Diego, these therapies include cupping and moxibustion. Cupping entails the application of suction via a ceramic cup to diseased areas of the body in order to increase circulation and promote healing, while moxibustion involves the application of heat generated by the burning of tightly wound herbs to selected acupoints. Dr. Mosher will carefully assess your body and diagnose the underlying source of your condition in order to create a therapeutic plan perfectly tailored to you. Acupuncture is a safe and effective therapy that has centuries of research, development, and wisdom behind it. For further information about acupuncture at our Poway practice, please contact Mosher Health today. Your body contains an intricate network of meridians, through which a substance called Qi flows. Qi is a fine, energetic substance that creates and controls all functional activity in the body, and its proper flow is essential to optimal health. When a meridian becomes blocked, the flow of Qi is interrupted, resulting in disease, pain, and other health disorders. Acupuncture restores the flow of Qi by clearing the meridians and allowing it to flow from areas where it has collected into areas where it is insufficient. Because optimal health is reliant upon proper flow of Qi, acupuncture is able to resolve or reduce most symptoms and conditions by restoring and regulating this flow. The World Health Organization (WHO) recognizes the effectiveness of acupuncture in treating a variety of conditions, including circulatory disorders, gastrointestinal disorders, gynecological disorders, neurological disorders, and even such common illnesses as cold and ‘flu. One of the most significant benefits offered by acupuncture is its ability to control pain and reduce patients’ dependence on potent painkillers. Dr. Mosher frequently uses acupuncture to treat several health conditions, and it is an integral part of his holistic approach to optimal health and wellness. When it is performed by a qualified, certified practitioner, acupuncture is a safe and effective therapy with few side effects or risks. Acupuncture originated in China more than 2,500 years ago. Since then, the treatment has spread through the world and has been adapted for various approaches. Dr. Mosher is able to provide effective therapeutic treatment with various forms of acupuncture including traditional Chinese acupuncture, Japanese style acupuncture, Korean acupuncture, Korean hand acupuncture, laser acupuncture, auricular acupuncture, and teishein. He is also able to use modern techniques that do not require the use of needles, but still provide significant benefits. Reaching back several thousand years, the history of acupuncture as a medical practice is a long and respected one. Initially a compilation of many disparate schools of thought, acupuncture was organized into a single system of medicine in 100 B.C.E and has since spread worldwide. Compatible with many medical systems, it has been adapted into numerous forms throughout East Asia, Europe, and the Americas. In the United States, it is regularly used in conjunction with contemporary medical practices. The cost of acupuncture depends on the condition being treated, the number and length of sessions, and whether the practitioner uses supplemental healing modalities such as cupping or moxibustion. Acupuncture therapy is not costly compared to conventional medical treatments. However, it is not always covered by medical insurance. Some medical policies will cover acupuncture treatments for certain conditions or for a certain number of sessions. Many people believe that acupuncture offers an excellent value both therapeutically and as a preventative tool for overall health.